If you are looking for information on the Sbarro franchise business opportunity, Sbarro franchises or Sbarro franchising, then you have come to the right place. Welcome! Since 1977, Sbarro has been giving individuals the chance at owning and running their own thriving businesses. The Sbarro franchise family includes many people of various backgrounds and parts of the world, all joined by a common thread: to determine their own future. When you purchase a Sbarro franchise, you become part of a global network of professionals. 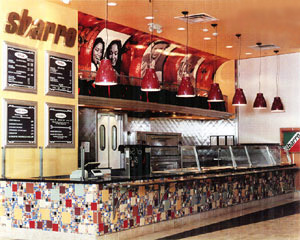 Throughout the entire franchising process, Sbarro provides in-depth guidance and support in your areas of operation. From food training to site design to marketing, Sbarro is there to assist you. Because of this support and brand flexibility, many entrepreneurs are able to open Sbarro restaurants in non-traditional locations that other investors may not consider. It is now operating and franchising nearly 1,000 restaurants in the United States and abroad, and has expansion opportunities all over the globe. The Sbarro vision of success is one that is shared throughout our national network of franchisees and family. We invite you to share this vision, and achieve your own personal goals with all of the rewards that go along with a Sbarro franchise. After 44 years, we are still a family owned and operated business, with a personal passion for success. Nearly 1,000 locations in both traditional and non-traditional venues worldwide. Plans for expansion all over the U.S. Rated the Number One Quick Service Restaurant in the Italian segment by Entrepreneur magazine for four consecutive years (2000, 2001, 2002 and 2003). Time honored recipes - Mama Sbarro's original recipes continue to inform our kitchens. The freshest ingredients - Sbarro sets and meets high standards for the freshest locally grown and imported ingredients. Consistency - Sbarro franchises are always authentic and value oriented. Buying power - Our size enables us to purchase the best ingredients, and help keep your inventory costs low. Business and restaurant training - Your first stop on the road to becoming a franchisee is an intensive, focused training course. Design assistance - our experienced team will help to make your site attractive and maximize space. Franchise Management - an experienced franchise manager is available to you to guide you through the process of opening your own Sbarro, from the store's inception through the successful day-to-day operations. An established regional network of suppliers, located in all four corners of the globe. Affordable investment - Sbarro works hard to make sure that owning your own franchise is an attainable goal. Brand flexibility - Sbarro can be found in airports, universities, travel plazas, train stations, hospitals, and many other high profile locations. Demand - Italian food is the number one meal preference for consumers worldwide.